Thanks Luke for being such great teacher and host. The guitar looks and sounds absolutely great, it’s a joy each time I use it. I can highly recommend the “Build it yourself” course to anyone! Also, it was pure joy to work with the three of you in the workshop – the trip of a lifetime!!! Looking back to the guitar building course makes me want to do it all over again. It was an incredible time in the beautiful mountain setting of Lavin. Lukas is such a kind and patient teacher and gives everything he has to make it a succsessful experience. I learned so much by watching and doing it myself. 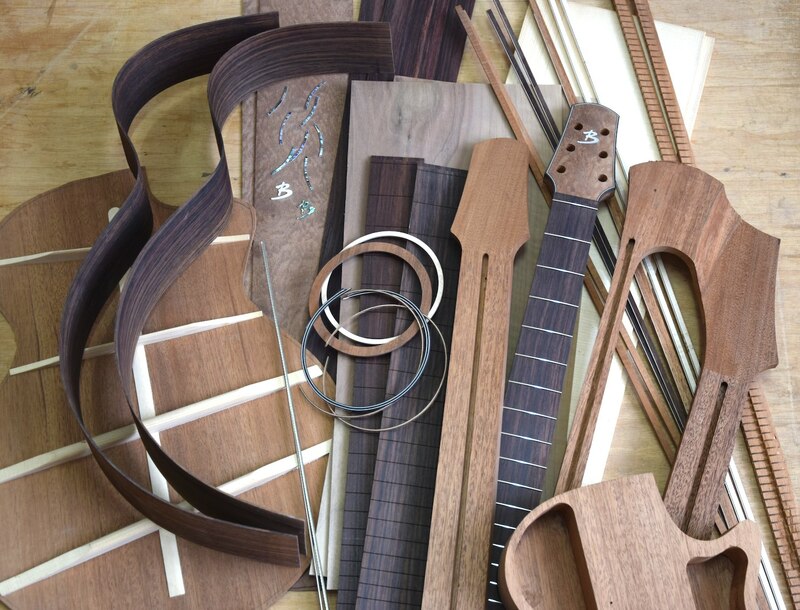 I loved the smell of wood in the workshop and all the tools that were available to do such finicky guitar building work. My guitar turned out amazing and I love playing it. It also was a privilege to get to know the Brunner family a bit and getting spoiled by Eva with coffee and treats everyday. I can highly recommend this course. Mit der Gitarre bin ich mehr als zufrieden, sie klingt toll, ein halbes Orchester, Sustain ohne Ende, fette Bässe und glasklare Höhen! Alles noch toller, als ich zu hoffen gewagt hatte! Und erst noch an dem Entstehungsprozess teilhaben zu dürfen! Vielen Dank für Deine Geduld und Dein Vertrauen, es hätte so viel schief gehen können, ist es aber nicht! Dass es mir als Laie gelungen ist, ein solch professionelles und nach meinen Vorstellungen gebautes Instrument herzustellen, erscheint mir nach wie vor als kleines Wunder. 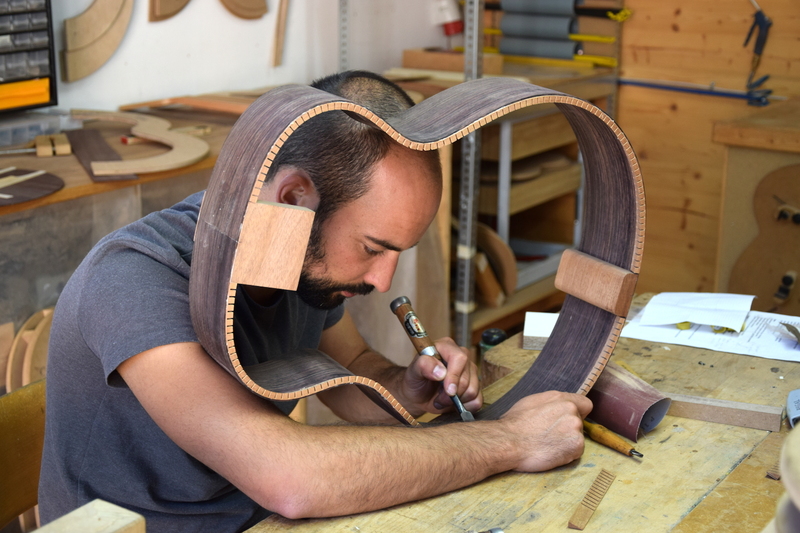 Lukas unkonventionelle Art, moderne Werkzeuge und Maschinen mit traditionellem Handwerk zu verbinden und sein Streben, sich immer neue Holzarten, Bauweisen und Formen anzueignen, haben mir als Gitarrenbaulaie geholfen, ein einzigartiges Instrument zu bauen. Die Ruhe und Abgeschiedenheit der Alpen und Famile Brunners Gastfreundschaft haben sicherlich zum Ergebnis beigetragen. I thoroughly enjoyed my time at the Brunner work shop. 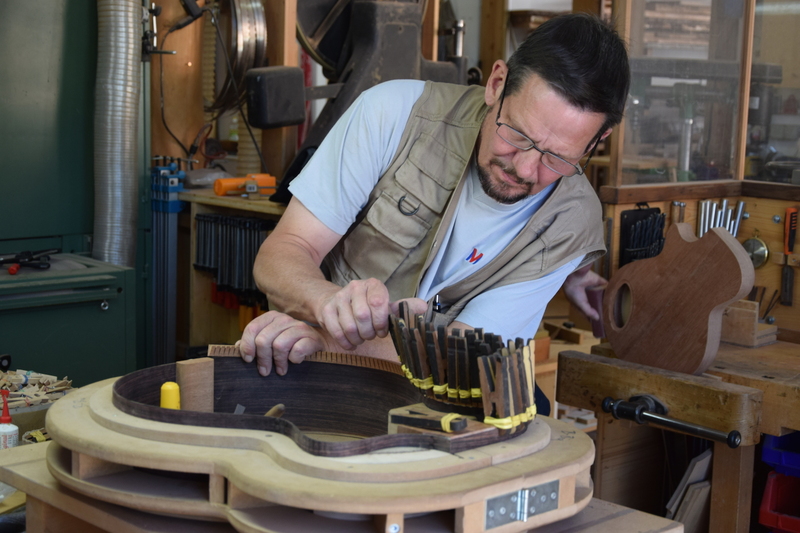 Lukas is a great teacher; patient and precise with a seemingly endless knowledge of guitar construction, innovation, and tone. The guitars sound amazing and are as beautiful as the alpine valley they are built in! I have had many teachers in my life. Some of them were experts in theirs fields, others had a special gift for passing on knowledge, again others simply loved being with the people whom they taught. In my opinion Lukas can intergrate all of this things in his teaching. He is very precise and careful, yet working fast. He is understanding and very creative. My stay in Lavin was crucial in my life. I recommend it to all interested!